The Steeple Chase is On! Ah, Vacation Bible School. Was there ever a more brilliant idea? Of course I'm too young for the days when a rickety old bus would wind its way through the dusty streets of town tooting its horn, with a sign painted on the side that said, "Follow Me to VBS!” But even though I never got to join the throng of kids who would stream from their houses and join the parade to the First Baptist Church (my Mom just took us in her car) I still recall how much fun I had once I got there. First, after lining up by class outside the big front door of the church, we proceeded inside in an orderly fashion. Next, three lucky sixth-graders got to come down the aisle with an American flag, a Christian flag, and a great big Bible, and we pledged our allegiance to all three. Nobody could sit down until the pianist played the "sit down” notes on the piano, at which point we fidgeted in the pews during the opening message ("blah, blah, blah, obey your parents, blah, blah, blah.”) When we heard the "stand up” notes, we knew it was time to file out and go to our classrooms. That's when the fun really started! Let's see; there were songs like "The Lord said to Noah there's gonna be a floody, floody”; and craft time where we made little shepherds out of clothespins, and sheep out of cotton balls and pipe cleaners. We sat in a circle on the floor around the Flannel Board listening to stories about creation; or we dressed up as Bible characters to reenact scenes from David and Goliath. Some little kid always ate paste out of the jar and had to be taken to the nurse, and usually at least once during the week the preacher himself came outside and shared soggy sugar cookies and lukewarm Kool-Aid with us on the grass. Vacation Bible School holds a special place in my heart. It's where I first heard about Jesus and first learned the words to "Down in My Heart” (and if the Devil doesn't like it he can sit on a tack! Ouch!) It's also where I first memorized John 3:16 out of (what else?) the King James Version. VBS is even where I first crossed paths with my future husband, back when we were only five years old! It's no wonder then that as a Mom I served as a Bible School volunteer, so that my children could benefit from the same experiences I had as a child. These days it's my daughter who is committed to working in her church's VBS for her own kids' sake. The good news is it's just a five-day program so her "tour of duty” isn't very long. The bad news is, because it's just a five day program, she'll still have a whole bunch of weeks to fill before school starts again in the fall. With any luck, the Baptists, Methodists, Presbyterians, Episcopalians, Catholics, Lutherans, Mennonites and Church of Christ will all hold their VBS's on different weeks, and if Lauren is smart – just like her mother and her grandmother before her – she'll enroll her kids in every single one of them! Yes, folks, it's that time of year again. Time for the annual Steeple-Chase. You know, I'll bet if I drove through town today in a bus that said "Follow Me to VBS”, they'd come streaming out of their houses in droves. Not the kids. I'm talking about their moms! Search for Childhood articles similar to "Follow Me To VBS!. 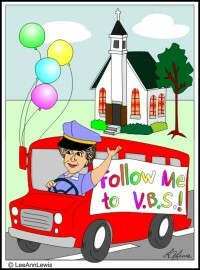 Search all articles similar to "Follow Me To VBS! ".